Electromagnetic interference (EMI), which can harm smartphones, tablets, chips, drones, wearables, and even aircraft and human health, is increasing with the explosive proliferation of devices that generate it. The market for EM-blocking solutions, which employ conductive or magnetic materials, is expected to surpass $7 billion by 2022. 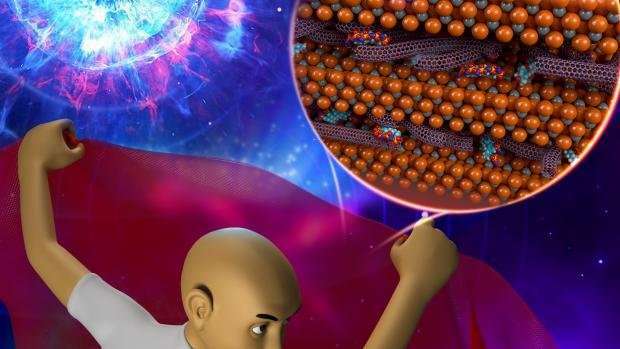 The process allowed them to fashion flexible, semi-transparent EMI-shielding film comprising hundreds of alternating layers of carbon nanotube (CNT), an oppositely charged titanium carbide called MXene—a family of carbide flakes first engineered by Gogotsi—and polyelectrolytes. Taylor explained that those charge characteristics confer benefits beyond EMI shielding. "As we worked to discern the roles different components play," he said, "We found that the strong electrostatic and hydrogen bonding between oppositely charged CNT and MXene layers conferred high strength and flexibility." He added that MXene has the dual benefits of being both adsorbing (it easily adheres to a surface) and conductive, which is important for blocking EMI. "And since the film itself is semi-transparent, it has the benefit of being applicable as EMI shielding for devices with display screens, such as smartphones. Other kinds of shields—metal for example—are opaque. Shielding is good, but shielding that allows visible light through is even better."